THE APPOINTMENT OF Danny Wilson as Scotland’s new forwards coach could lead to Dan McFarland linking up with Ulster sooner than expected. Dan McFarland was named as Ulster’s next head coach in April after he activated a get-out clause from his current role with Scotland, who will be Ireland’s Pool A rivals at the 2019 World Cup. The SRU said that the former Connacht forwards coach was set to serve a nine-month notice period before leaving his position, but The42 understood at the time that he would be free to join Ulster as soon as a replacement was appointed. 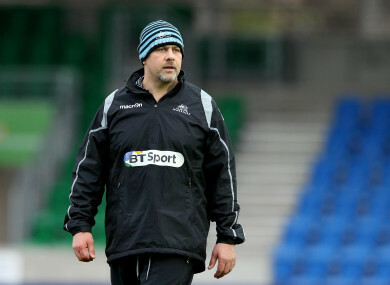 Speaking to BBC Sport last month, Scotland head coach Gregor Townsend stated that McFarland would remain in his current role until 21 January 2019, and added that he would be travelling with the squad for their current tour of North America and Argentina. “Carl Hogg’s joined us for our coaching meetings and him and Dan will share responsibilities on this tour,” he said. Former Cardiff Blues coach Wilson has since been confirmed as Scotland’s new forwards coach after terms were agreed to release him from a deal to join Wasps, where he was set to work under the director of rugby Dai Young. This development could lead to McFarland taking up his new position with Ulster ahead of the 2018/19 season on a three-year contract to succeed Jono Gibbes. Scotland started their summer tour with a comprehensive victory over Canada earlier this month before losing out narrowly to USA over the weekend. They face Argentina in their closing Test on Saturday. Email “Appointment of Scotland's new forwards coach could speed up Dan McFarland's move to Ulster”. Feedback on “Appointment of Scotland's new forwards coach could speed up Dan McFarland's move to Ulster”.